Love it or hate it, DLC is here to stay. With pre-orders being a vital measure for the industry you can expect more and more DLC being offered as pre-order incentives. And the upcoming Assassin’s Creed Unity, which is being set in France during the French Revolution is no different. 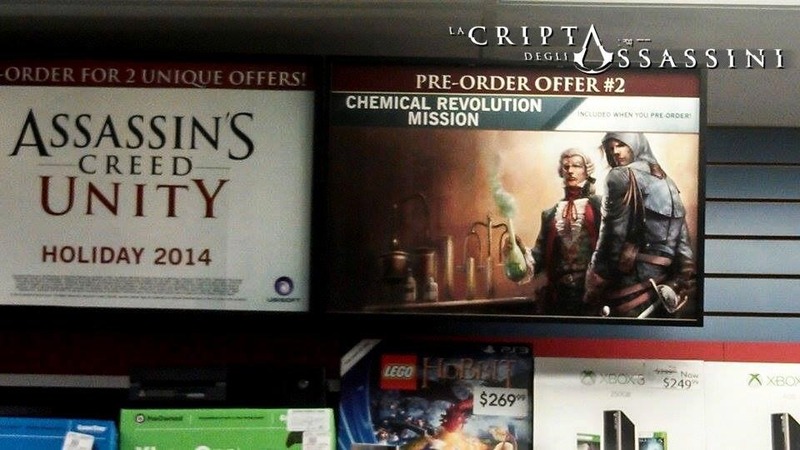 A Gamestop somewhere in America has put up a pre-order poster a little bit early and it is now hit the Internet thanks to CriptAssassini. As you can see the pre-order DLC is called Chemical Revolution and features a scientist holding a bubbling beaker. We can also see it is the second pre-order offer but unfortunately we don’t get to see what the first one is. And this is exactly why I hate this sort of pre-order offer. Firstly I wouldn’t recommend pre-ordering anything as you really don’t know if the game is any good before the reviews come out, which means you can end up with rubbish on day one that you are going to spend weeks complaining about. But the bigger problem is now that they are offering different pre-order bonuses to different retailers or versions of the game it has become impossible to actually experience the entire game without buying multiple copies which just feels wrong to me. I like the Assassin’s Creed games but I wouldn’t say I’m a big fa,n and knowing that I can’t actually play the entire game definitely puts me off the franchise. But it’s Monday morning which is depressing enough so to inject some fun into this post here’s a video showcasing the multitude of easter eggs in Watch Dogs that allude to the Assassin’s Creed storylines.